If you know your enemies and know yourself, you will not be imperiled in a hundred battles; ... if you do not know your enemies nor yourself, you will be imperiled in every single battle. Sun Tzu (孫子 Sūn Zǐ; c. 6th century BC) was a Chinese general, military strategist, and philosopher who lived in the Eastern Zhou period of ancient China. 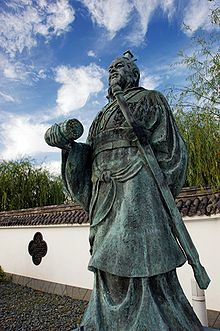 Sun Tzu is traditionally credited as the author of The Art of War, a widely influential work of military strategy that has affected both Western and East Asian philosophy and military thinking; also known as Sun Wu (孫武; Sūn Wǔ), and Chang Qing (長卿; Cháng Qīng). Note: "If his forces are united, separate them" is also interpreted: "If sovereign and subject are in accord, put division between them." Know your enemy and know yourself, find naught in fear for 100 battles. Know yourself but not your enemy, find level of loss and victory. Know not thy enemy nor yourself, wallow in defeat every time. It is the rule in war, if ten times the enemy's strength, surround them; if five times, attack them; if double, be able to divide them; if equal, engage them; if fewer, defend against them; if weaker, be able to avoid them. In the practical art of war, the best thing of all is to take the enemy's country whole and intact; to shatter and destroy it is not so good. So, too, it is better to recapture an army entire than to destroy it, to capture a regiment, a detachment or a company entire than to destroy them. Alternative translation: Subtle and insubstantial, the expert leaves no trace; divinely mysterious, he is inaudible. Thus he is master of his enemy's fate. Alternative translation: O divine art of subtlety and secrecy! Through you we learn to be invisible, through you inaudible and hence we can hold the enemy's fate in our hands. Attributed to Sun Tzu in multiple books and internet sites, but this text does not appear in The Art of War and seems to be a more recent creation. My father taught me many things here. He taught me in this room. He taught me: keep your friends close but your enemies closer. This attributed to Sun Tzu and his book The Art of War. Actually James Clavell’s foreword in The Art of War states, “’the true object of war is peace.’” Therefore the quote is stated by James Clavell, but the true origin of Clavell's quotation is unclear. Nonetheless the essence of the quote, that a long war exhausts a state and therefore ultimately seeking peace is in the interest of the warring state, is true, as Sun Tzu in Chapter II Waging Wars says that "There is no instance of a country having benefited from prolonged warfare. It is only one who is thoroughly acquainted with the evils of war that can thoroughly understand the profitable way of carrying it on." This has been interpreted by Lionel Giles as "Only one who knows the disastrous effects of a long war can realize the supreme importance of rapidity in bringing it to a close." Dr. Hiroshi Hatanaka, President of Kobe College, Nishinomiya, Hyōgo, Japan is recorded as saying "the real objective of war is peace" in Pacific Stars and Stripes Ryukyu Edition, Tokyo, Japan (10 February 1949), Page 2, Column 2. Sun Tzu among many other military thinkers and leaders believed in fate and determination from the correct application of theory, the state of the opponent's and one's own power, and a code for the general and a code for the soldier to follow, rather than the Machiavellian type of intuition that evokes an evolution of opportunism that brought great historical consequences as it dominated over the classical and medieval ethical doctrines. Thus this statement is contrary to Sun Tzu principles. Nevertheless, there is a possible relation to the quote: Quickness is the essence of the war. The King of Wu said，"Enough, general. Retire to your hostel, We do not wish to come down and observe." Sun Tzu said, "The king only loves the words, he cannot make use of the reality." After this, Ho-lu knew that Sun Tzu could command troops and in the end appointed him commander. [Later when Wu] defeated mighty Ch’u to its west and entered its capital Ying awed Ch'i and Chin to its north and spread its fame among the feudal lords, it was due in part to Sun Tzu. translated by Tsai-fa Cheng, Zongli Lu, William H. Nienhauser, Jr., and Robert Reynolds, in The Grand Scribe’s Records, edited by William H. Nienhauser, Jr.
translation by ‎Wang Jing, in The Grand Scribe’s Records, edited by William H. Nienhauser, Jr.
Sun Tzu’s success teaches us that a successful general is one who fully calculates his approach and plans to fight in a battle. However, the average reader is not able to identify Sun Tzu’s teachings on a deeper or philosophical level. This is my reason for writing and exegeses on the Art of War. The one thing missing from The Art of War is love, ... any sense of altruism, any sense of loving your neighbor. It's just a[bout] how to take advantage of your neighbor, how to triumph over your neighbor, how to manipulate your neighbor. I'm sorry... It's a very nasty book. How to use your spies — that chapter thirteen on spies — is chilling. The whole book — of course it's very clever, and of course a lot of it is very true, and of course we can go through life treating people in that way if you want to, but I don't happen to believe that's the best way to go. ... The Lúnyǔ [Analects of Confucius] is a superior book to Sūnzi bīngfǎ [The Art of War] because the Lúnyǔ talks about morality, talks about caring for your fellow human being; after all, the whole idea of ren ... doesn't come in Sūnzi bīngfǎ at all. Sūnzi bīngfǎ is: how to use your friends and neighbors in order to get the better of them. That doesn't make me feel good. I'm an old-fashion kind of guy, and I believe in being nice to people whenever I can. ... You don't go out of your way like Sun Tzu to manipulate everybody including your friends. For me, Sūnzi bīngfǎ is the dark side of Chinese culture. It's the dark side. And, I know it's there. And there's a dark side to Western culture too. And, therefore, it's important to be aware of it, but not to be corrupted by it. Not to be polluted by it. Because it is a very powerfully-polluting little book. Very nasty little book. Let's not pretend otherwise.